It's the day they've always dreamed about. But will it turn out to be a nightmare …? Bel's friend, ice-cream parlour owner Violet, is engaged to Glyn, who is besotted by her although Violet fell out of love with him long ago. But however trapped she feels in the relationship, she can't quite say the words, 'I don't want to marry you anymore.' Then, just when she's about to give up and resign herself to married life, she finds love in the most surprising of places. Will duty rule her heart or will she allow herself to be swept off her feet? Max was planning a quick registry office do with her fiancé Stuart until she sees a TV programme about traveller brides and becomes determined to have the most extravagantly glitzy wedding ever. But in all the excitement has she lost sight of what's really important? Does she want the wedding more than she wants the groom? Milly Johnson has definitely earned her best selling author title. Her novels are fun, feel-good, giggle worthy, romantic and fairy tale-like and White Wedding is no exception. The three women featured in this novel are about to go on an adventure in wedding land and they may not end up exactly where they predict they'll go and I enjoyed reading about their adventure. I love the characters Milly Johnson creates. They're warm, lovely and you can't help but root for them to get what they want and deserve in life. The friendships she portrays in her novels and the relationships between women always leaves me with the warm and fuzzies and want to curl up next to them on the couch with a glass of wine or a bag of crisps. The last 50 pages of White Wedding had me flipping frantically and was the most fun I had during the novel and there were many bits revealed that I was not expecting. Unfortunately throughout the rest of the novel, I found it a little slow at times, probably because it was pretty predictable so I knew what was going to happen most of the time and found myself wondering how long a section would take before things was revealed. 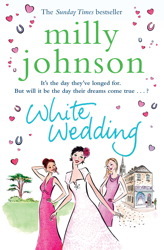 As someone who has just began planning a wedding, I actually found this novel a bit depressing and can't fathom what someone reading with doubts might feel - spurred into action I would hope and maybe this was Johnson's intention. So maybe this hindered my opinion somewhat as I read with trepidation much of the time. Overall if you're looking for a light, easy to read novel, pick this one up. I tend to prefer hard hitting novels these days, so this is probably the reason I'm not rating this one as high as I could. I think Johnson will forever chase the first, and favourite, novel I read of hers, A Spring Affair, which will remain one of my favourite British Chick Lit novels.